Utilizing 2D or 3D data combined with RADAN’s knowledge of your machine tool and nesting capabilities allows eQuote to quickly arrive at accurate costs. The subcontract sheet metal environment is amongst the fastest changing and demanding in modern manufacturing, clients expect their parts to be delivered in two days and quoted in two hours, anything less and the work goes elsewhere. eQuote uses your customers’ geometry, the RADAN CAM system and a database of additional operations to arrive at part costs quickly, effectively and accurately. The estimation engine within eQuote utilizes a comprehensive operation modeler, this in conjunction with the CAD/CAM data allows the use of synthetic data for calculations relating to almost any part property, for example; from CAD data we can see that the component has four bends, we also know the size, material, thickness and weight, using this information we can very accurately estimate a time to bend the component and can accurately add handling time and additional labor if required based on the components physical properties. Traditional MRP systems and quotation systems do not easily cope with the use of sheet materials, especially where components are nested together. 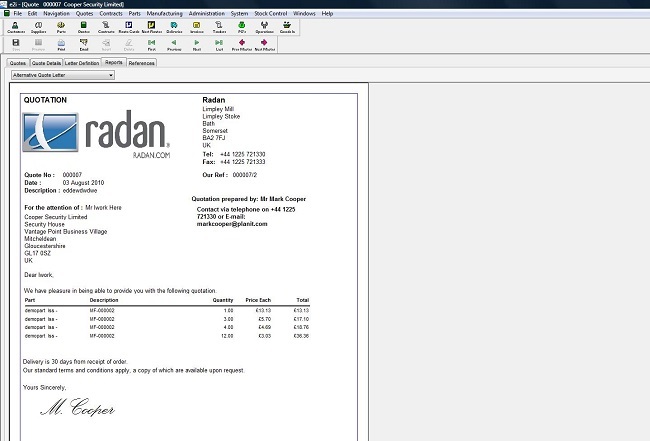 eQuote can reuse the CAD data that generated the costing during the quotation by sending the geometry back to the RADAN nesting module with a list of materials, the system will calculate the best sheet utilization to produce a quantity of similar items or batches of dissimilar items from different materials.